Enjoy a romantic break in Torquay even more with our top 10 romantic things to do while you’re there. The National Trust’s Greenway House has been called “the loveliest place in the world”. Famous for being novelist, Agatha Christie’s holiday home the house is filled with archaeology, Tunbridgeware, silver, botanical china and books. In the garden the romantic woodland drifts down the hillside towards the sparkling Dart estuary. The walled gardens house a restored peach house and vinery, and a visit to Greenway has to take in the Boathouse, which was scene of the crime in the novel, Dead Man’s Folly. This beautiful historic house houses a museum and art gallery with regularly changing exhibitions. The gardens are a major attraction with exotic plants and flowers from around the world displayed in the glass houses. Delight your taste buds in The Imperial Hotel’s award-winning Regatta restaurant overlooking beautiful Torquay Bay. As well as having 2 AA Rosettes for its stunning food it has equally stunning views across the bay, which is magical by day and by night. Discover all things historical from the Victorian times up to the 1950s in this fascinating museum. See how our grandparents used to shop in the 40s/50s shopping arcade and enter a wonderful world of fantasy with buildings you’ll recognise from around the world. 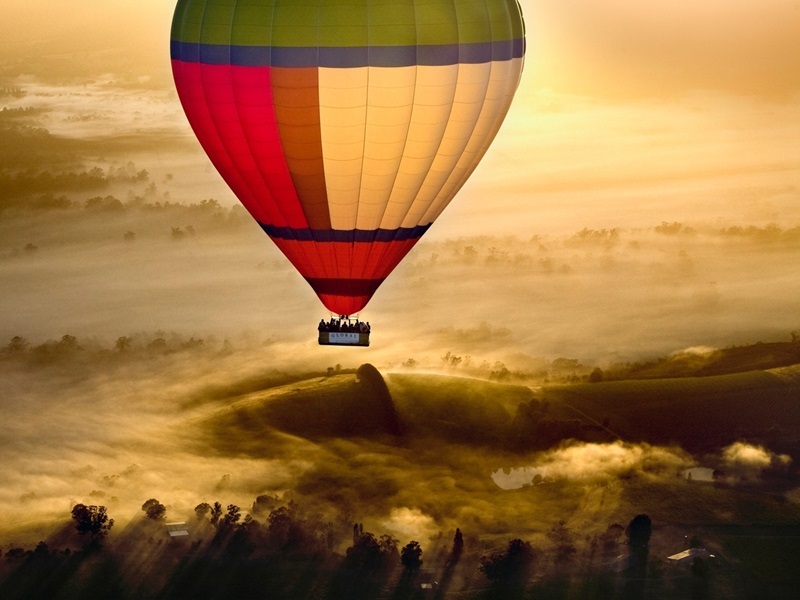 Have an experience of your lifetime with a romantic trip for two in a hot air balloon. Enjoy breathtaking views over the Devon countryside and coastline as you sup champagne. A range of tours are on offer, from a simple self-guided ‘Trek and Taste’ to a guided ‘Vine to Wine’ walk with knowledgeable tour guides. For those looking for a more in-depth tour with lunch included go for the full Sharpham Experience. Sit back and enjoy the views of the picturesque village of Cockington, which has been described as “the prettiest village in England”. with its thatched cottages and chocolate-box landscape. Carriage rides to Cockington run to and from Torquay seafront through the country lanes into the heart of the village. Choose from a wide range of treatments and spa packages that are guaranteed to get you glowing and revived to enjoy your romantic break all the more. You can have couples treatments together or enjoy some time alone. There’s always something exciting going on in Torquay’s Princess Theatre. This month you can choose from Thriller Live, Elvis the Ultimate Performance and Tonight’s the Night, the smash hit West End musical comedy. Nearby Brixham’s Arts and Crafts Market is a local institution. There are around 20 harbourside stalls, each one offering unique handmade and unusual gifts. Artists set up their easels and paint right in front of you and you can browse through stall containing handmade jewellery, original art work, photography, handmade greeting cards, fused glass, hand dyed silk products, handmade children’s clothes and much more. What’s your top tip for romantic things to do in Torquay?